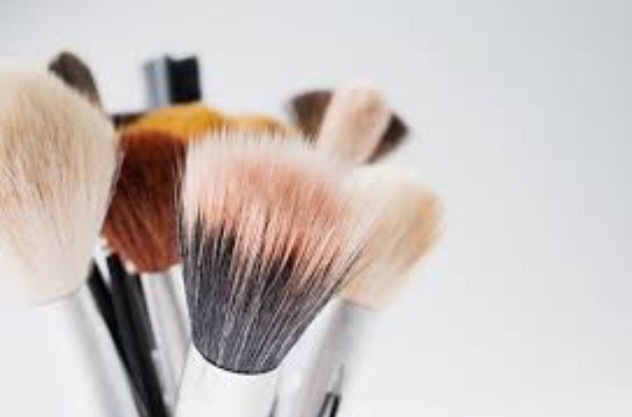 Your collection of makeup brushes may include contouring brushes and blush brushes. But, did you know that cleaning your brushes should be a part of your regular beauty routine? Makeup residue, dirt, and oil can become trapped in the bristles. This contributes to pesky breakouts. Keeping brushes clean is a quick process. Spraying a brush cleaning solution on brushes after each use ensures they are free of residue. On a weekly basis, brushes should be thoroughly cleaned. Warm water removes residue. Swirl brushes in a soap and water solution to clean them. Run the bristles under warm water and wipe clean with a cloth to reshape the bristles. Laying brushes flat keeps the bristles shaped. You should remove excess water from the bristles before leaving them to dry. This will also prevent brushes from losing shape once they dry. Do you have any tips you swear by to clean makeup brushes? If so, leave a comment below! This summer, I kept busy with travel and writing. I tend not to travel often. This summer, I took trips to both Florida and Montreal. While in Florida in early June, I spent time relaxing and shopping. This had been my third trip to Orlando, but was the most relaxing one to date. Taking a week to soak up the sun, shop some of my favourite retail outlets, and dine kept me eased. While the purpose of my Montreal trip was for medical reasons, I still snuck in shopping and dining. I began this blog on a whim, never expecting it to grow as it has. As a teenager, I wrote in my spare time. Since beginning university, I have not had much opportunity to write for leisure. This blog continues to be an effective outlet for my creativity. I kept busy with leisure activities. I spent most of my days swimming, shopping, and relaxing. I decorated for weddings during a handful of weekends. A question for my readers: How have you spent the summer? I picked up this lipstick while in Montreal earlier this month. Surprisingly, this is the first TOO FACED cosmetic I bought. This was an impulse buy – while browsing in Sephora, I decided to try a new colour. And try, I did. I bought the colour Queen B; a lilac-mauve. This lipstick is packaged in a box bearing the same colour as the product. As with other Too Faced products, the gold script on the package is eye-catching and vibrant. Queen B is a soft mauve. The colour is intense, but not too bright. Before I bought this lipstick, I hesitated. I put a swatch of the colour on my arm in store, and liked the shade. This softer shade of mauve is ideal to give the lips a pop of subtle colour. This liquid lipstick dries quick. To achieve a darker shade, the colour can be applied twice. The formula is a little drying on the lips, but this is resolved by applying a lip balm underneath. Queen B wears comfortably for 6-8 hours without fading. Though this liquid lipstick dries my lips more than other formulas, it is richly pigmented and applies smoothly in one swipe. The colour payoff is excellent. Though this colour is different from anything I’ve worn before, it is eye-catching and beautiful. 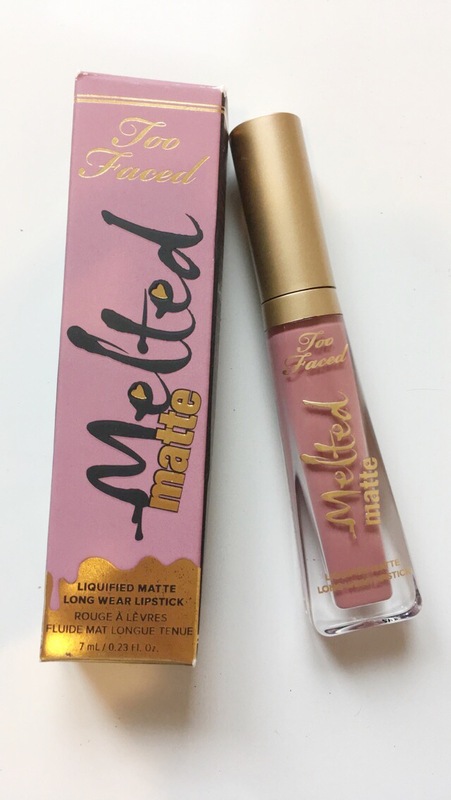 Too Faced Melted Matte liquid lipstick is available in 17 shades. It is available in-store or from Sephora’s official website for $25. This lipstick retails on Too Faced Cosmetics official website for $29. Use a single calendar. Colour-coding a single calendar with due dates, extra-cirricular activities and personal dates (i.e. birthdays, social events) ensures all important dates are visible. Writing all due dates for the semester on the first day of lectures is a trick I use to sketch out the semester for myself. Separate and organize course materials. Whether you track your course work electronically or on paper, keeping related materials together keep them organized. Get a planner. Planners offer monthly, weekly and/or daily views. Write out important due dates and reminders to keep yourself on-track with the semester. Label all sets of notes. When the time comes to study for an exam, having notes labelled and dated allows you to locate specific topics. Tidy up your study space. Place your calendar in clear view to reference due dates for the month. Dedicating specific areas of your desk for study materials allows for access when needed. Time management is key. This is important whether you take courses online or on campus. Set aside a specific time of day to review daily lecture notes and to plan ahead for the upcoming week. Managing your time allows you to divide your tasks into sections. Colour code your courses. Using a separate colour scheme for each course keeps material organized and visible. Maintain self-care. Staying organized is not simple if you are mentally drained. Take time to get enough sleep, eat healthy, and exercise. Motivating yourself to stay organized is easier if you have high energy levels. Start early. Many of us procrastinate. Better work quality results if you begin readings and assignments early. Separating work into manageable chunks may decrease stress levels, especially as due dates approach. Create a filing system. If you are taking courses with many readings, having file folders for all relevant course readings is helpful when the time comes to study for an exam or write a paper. After sharing a peek into my makeup bag, I decided to write about my must-have cosmetics for summer. I like all shades of reds and pinks. During summer months, I tend to favour bright lipstick shades. The main shades I return to all summer include a watermelon-pink, orange, and red. 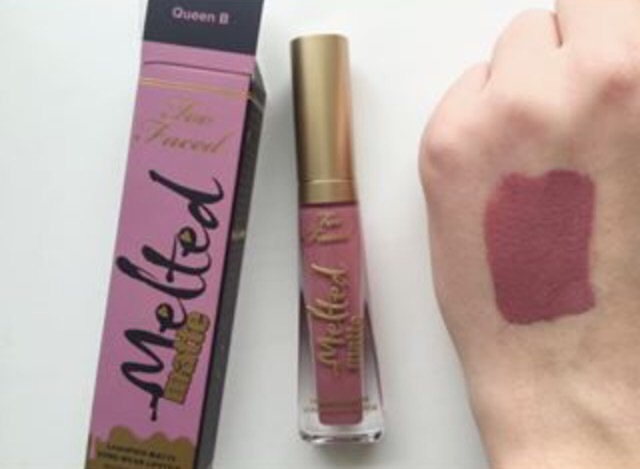 I recently purchased Too Faced Melted Matte liquid lipstick. I bought the colour Queen B; a mauve-lilac. It is a different shade from what I wear, but it is ideal for the summer! During warm summer days, my go-to mascara is waterproof. Waterproof formulas are ideal whether you are in the heat, cooling off, or readying for a night out. Moisturizer is paramount to keep skin soft and smooth. If your skin dries after a day in the sun, applying a moisturizer helps replenish lost moisture. Most times, I match my lipstick with my nail polish. Brighter nail polishes are fun and add a pop of colour to any outfit. In the summer, I tend to reach for pinks, oranges, and blues. What are some items you cannot live without during the summer? I finally have my hands on this palette! After having no luck finding it at my local Sephora, and the Sephora in Montreal, I ordered it online. (At 6:30 in the morning, no less.) The eye shadow palettes I currently own have cool tones. I’d been searching for a warmer-toned palette for a while, and the colours drew me to this one. 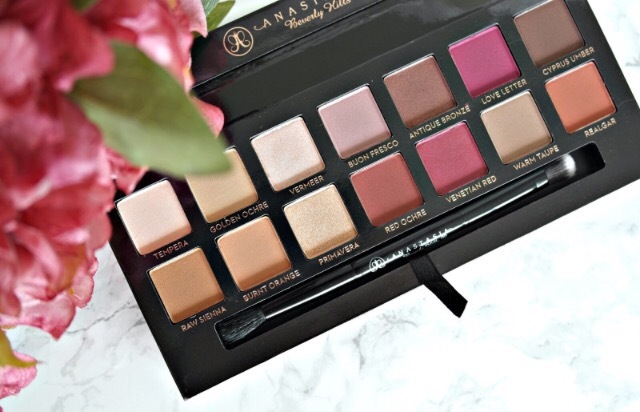 Anastasia Beverly Hills Modern Renaissance comes in a pink box with white lettering. The palette itself has a pink velvet cover. This palette may be difficult to keep clean, but time will tell. The double-ended brush is a good size, but does not feel as smooth compared to other brushes I own. The 14 shadows in this palette are an array of reds, taupes, and other earthy tones. This is the first warm-toned palette I bought. The colour selection is what initially drew me to this palette. 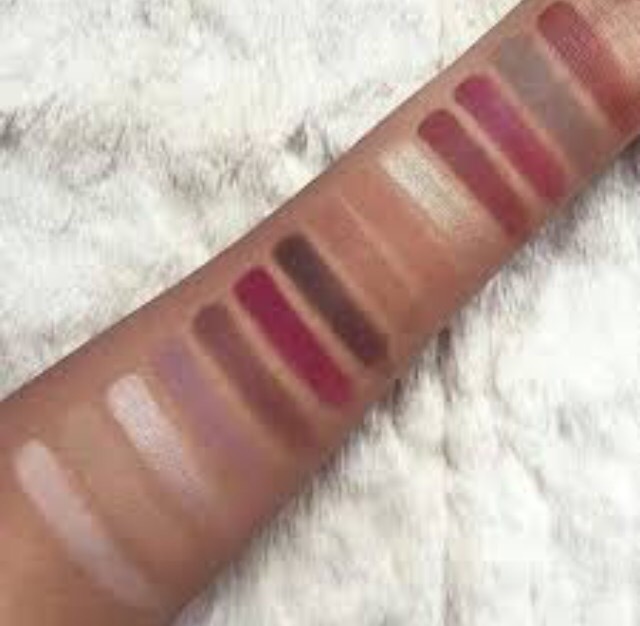 In the pan, these eyeshadows appeared powdery in texture. I worried that they would flake. After applying the eyeshadows to my lid, the shadows stayed vibrant and did not flake. These shadows are pigmented. The texture is surprisingly buttery and smooth. The shimmery shades may need an extra application, but the colour payoff is excellent. This palette delivers a new spin on neutral colours. These neutrals mix with pops of red, orange, and pink. Anastasia Beverly Hills Modern Renaissance is available on Anastasia Beverly Hills official website for $42. It is available from Sephora’s official website for $55. A variety of methods work well to apply facial makeup, whether it is a brush, a sponge, or your fingertips. Each method results in a different degree of coverage. After brushing concealer into the areas you wish to cover, pat it into place to allow it to set. Your skin type should determine what foundation you use. Powders work best with oily skin whereas liquid foundation works best with combination skin. To prevent foundation from drying, dispense it onto the back of your hand and blend into the skin. This is helpful when blending two foundation shades. When applying foundation, the best method is to start in the t-zone and blend outward. Applying a pressed powder to the face following foundation helps it set on the skin. Powder also helps reduce shine and redness. If using powder on the entire face, a medium-sized makeup brush helps cover each area. For covering specific areas of the skin, a sponge or the fingertips is most effective.